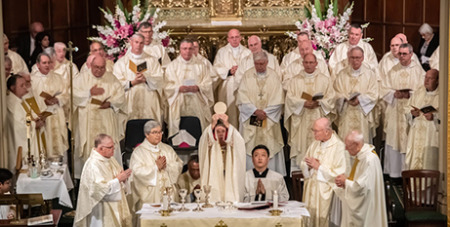 Hundreds of people, including bishops from across Australia, filled Sydney’s St Patrick’s Church on Sunday for an historic Mass commemorating the preservation of the Blessed Sacrament in this country. Source: The Catholic Weekly. Sydney Archbishop Anthony Fisher OP, who presided over the Mass, pointed out that the site of St Patrick’s could be considered the birthplace of the Catholic Church in Australia. In his homily, Archbishop Fisher recounted the story of Irish priest Fr Jeremiah O’Flynn, who in May 1818, left behind the Blessed Sacrament with the Catholic laity of the colony of Sydney, before he was deported to England. Following the Mass Archbishop Fisher encouraged those present to have hope for the future of the Church in Australia.